Breakfast is the most important meal of the day for some, but for those who manage to squeeze some gym time into their routine, pre- and post-workout foods can be just as huge. 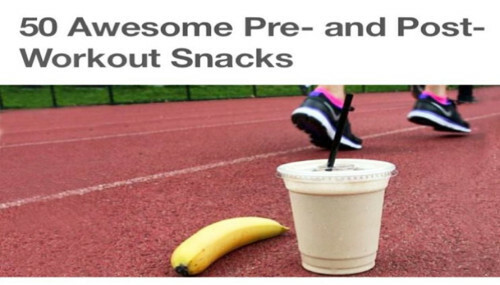 While everyone’s nutritional requirements are different depending on their goals and activities, these snacks can offer the right balance of carbohydrates, fats, and protein to satisfy hunger, fuel workouts, and aid in recovery. Feeling fancy, huh? Top ¼ cup nonfat yogurt with ½ cup whole grain cereal and ½ cup fresh strawberries. Put a twist on the classic kids’ treat by blending 1 scoop vanilla whey protein powder, 1 cup orange juice, and 1 cup ice. Infuse 1 scoop chocolate whey protein with 2 teaspoons of extra virgin coconut oil. Need a pre-workout pick-me-up? Greatist’s fitness editor suggests blending 1 cup iced coffee (keep the ice) with 1 scoop chocolate whey protein.